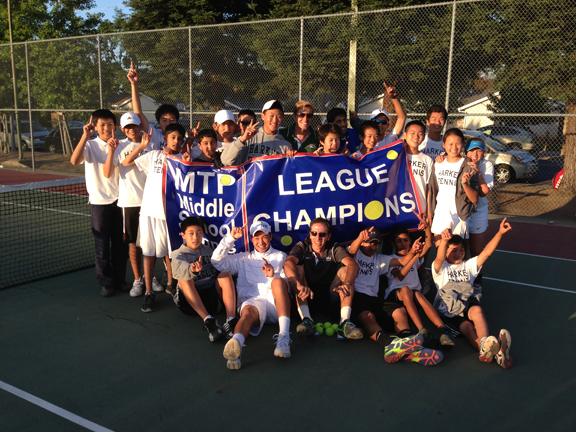 For the first time, the middle school varsity-A tennis team (grades 6-8) has swept both public and private league championships, winning 5-4 against Kennedy last night to clinch the second title. The team went 20-0 for the season. This is the first time the team has gone undefeated in both the regular season and the playoffs, and the first time the team has won both the private and public middle school tennis titles. “This is about as big as it gets in middle school sports!” said Greg Lawson, assistant head of school for student affairs. Lawson added that over the last two years, the team compiled a 36-2 record and won three of four divisional titles. “Coach John Fruttero has done amazing things with the team,” Lawson added.